In this article, we have collected 8 new best websites themes of 21st September 2014. This themes are the well-designed and have lots of great features. Spider WordPress Theme is a flat, creative portfolio WordPress Theme for agency business or creative people. It is fully responsive and looks great on all screen sizes. Try demo now to experience this awesomeness and to explore more features in this theme. Rakata is a clean and minimal blog and portfolio theme. The layout is designed specifically to make sure that the focus is on your content. Try demo now to experience this awesomeness and to explore more features in this theme. Mindig is an multipurpose WordPress eCommerce theme beautifully designed unique elements parallax, video and gradient backgrounds CSS3 animations, icon fonts and much more. This theme has 14 demo layouts ready to use for Shop, Corporate, Portfolio and One Page website. Try demo now to experience this awesomeness and to explore more features in this theme. HYPNO is a clean and unique HTML5 template, fully responsive, easily customizable, based on popular Bootstrap 3 grid. Hypno features Ajax driven portfolio, Slider Revolution, Flex Slider, Owl Carousel and much more. Try demo now to experience this awesomeness and to explore more features in this theme. THEONE is a responsive WordPress portfolio One page theme for the professional creative. It’s easy to use and concentrates on showcasing your work to potential clients and employers with interesting interactions. The self-developed Page builder makes it very intuitive to build your unique posts and pages. It could be used for Multi-page site easily also. Auto Image is absolutely unique powerful WordPress tools for selling autos and other vehicle marketplace template. Theme developed for car dealers who is looking for something a little bit different. You can sell various types of vehicles including cars, bicycles, boats, etc. 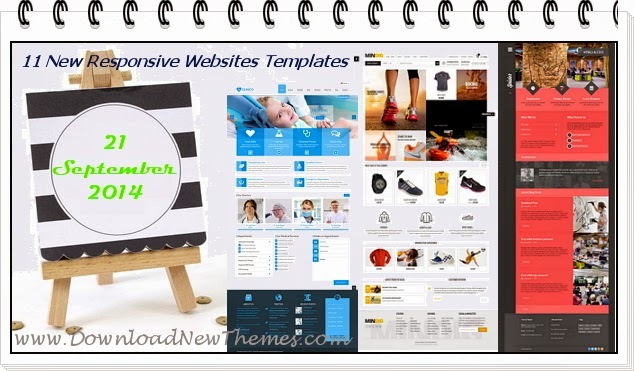 Item Reviewed: 11 New Responsive Websites Templates of 21st Sep 2014 9 out of 10 based on 10 ratings. 9 user reviews.